Scroll means that all jaws close together and are self centering. 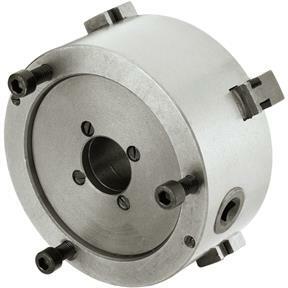 This 4-jaw chuck has a semi-steel body and two sets of hardened jaws. 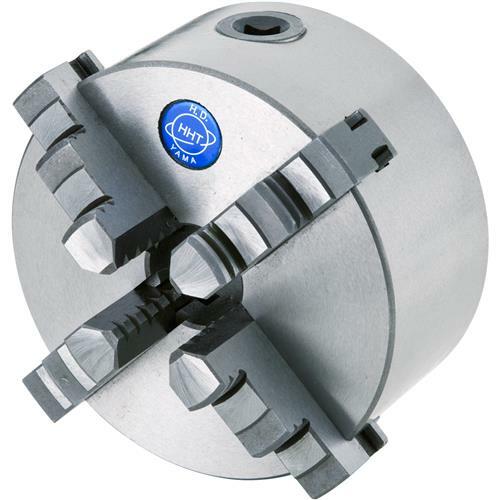 4-jaw self-centering chucks have firmer hold on the workpiece and also allow you to grip square pieces without switching chucks. Requires mounting plates. Through hole: 1.18"
Ok for a mini Lathe like the G0765 this might be a little big... I got the face place from Littlemachineshop and it worked great. The run out was almost none around 10 th. The motor appears to be handling the Chuck fond it starts a little slow and the shut down is also a little slow (keeps turning). Anyway it does help in maintaining the torque needed with cutting some material. Some it is a plus for me just have to know you job and the requirements. the G0765 is a very small lathe so cutting is an issue with some steels and likewise hardness. I a nut shell I exchange the chuck on the lathe from the 3" to the 5" when needed. I only use the 5" when the job requires the torque. Have fun and hope this help some of you home hobby guys like me. Side note What I know now If able to do over I would have spent more for the larger Lathe.